Scene setting: The Musée de Cluny houses one of the largest collections of medieval art in the world. Located in a former townhouse from the 14th century, the museum has a Renaissance façade. In 2016 its permanent exhibition rooms were overhauled by Le Studio Adrien Gardère and Bernard Desmoulin Architecte. These bare-bricked, sculpture-lined rooms were the location for Lanvin creative director Bruno Sialelli’s debut show for the brand. The 32-year-old designer recently worked for Loewe menswear and also cut his teeth at Balenciaga and Acne Studios. In recent years, the oldest couture house in France has worked to regain the footing of its heritage, after creative director Alber Elbaz departed the brand in 2015 following his 14-year tenure. In womenswear, two more creative directors followed, and in August 2018, the brand acquired a new owner – the Chinese conglomerate Fosun International. The show’s location nodded to a label in the midst of its own renaissance. Mood board: In his show notes, Sialelli made reference to ‘a symphony of romantic archetypes’. There were allusions to Lanvin’s heritage here – like the opening knitted dress with an inbuilt cape in the brand’s signature Quattrocento blue, or full swishing skirts which nodded to the brand’s robe de style silhouette, or prints of the brand’s 1924 Paul Iribe designed La femme et l’enfant logo. 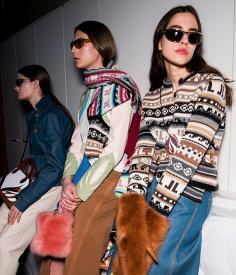 Amongst the multifaceted offering, there were also tartan capes and trenchcoats with knitted Norwegian blanket details for women, and for men, sailor’s suits and retro leather jackets with scalloped edges.